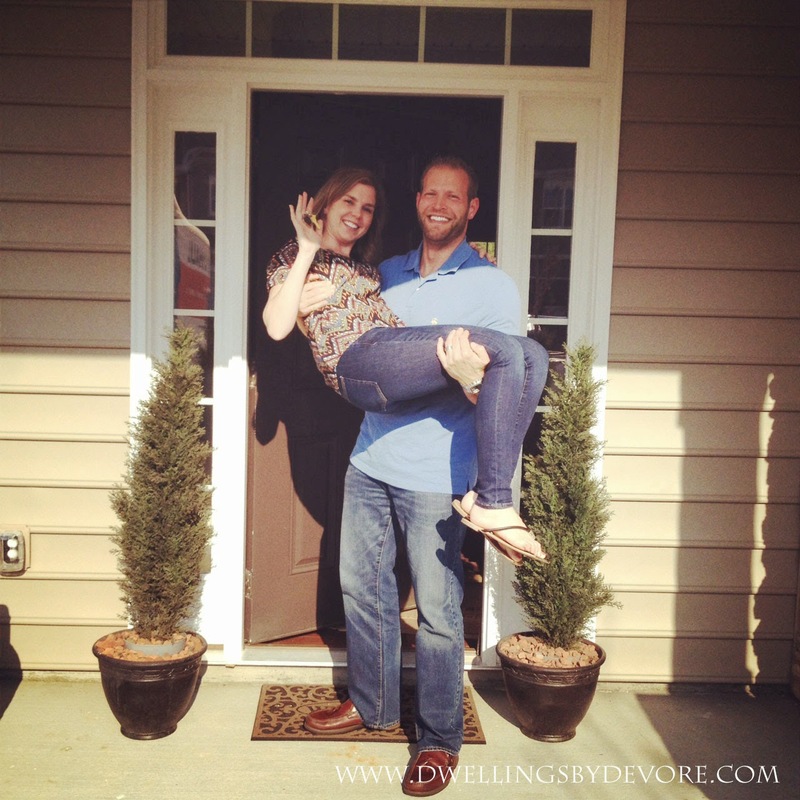 If you follow me on instragram (dwellingsbydevore) you saw that we closed on our new home last week. Yay!! I couldn't be more excited to have the hard part behind us and the fun decorating stuff ahead of us. Since we are moving into a new build we are in the process of hanging curtain rods in almost every room. So I thought I'd share a little trick with you on how I hang curtain rods really easily and get them even with no measuring. It seems like no matter how many times I would measure and try to get it exact it would never come out perfectly and it would drive me crazy. So my mom and I came up with the idea to make a template. We used this on all the curtain rods in our old home and I'm doing it again this time around. It's so much easier! And if you're like me and don't want to have to wait on another set of hands to get it done, you can easily do this by yourself. All you do is just cut a piece of paper, cardboard, whatever you have laying around to the size you need it to be. 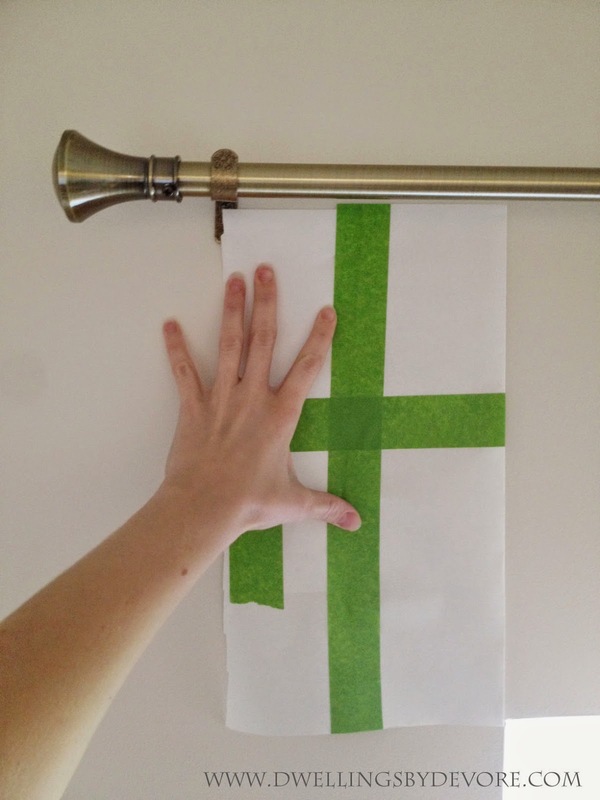 Then you just place it by the window like so and make a mark in the top left corner where you want your screw to go. As you can see it doesn't have to be perfect. I had to tape some paper together because we are still unpacking and I couldn't find a big enough piece of paper. Then on the opposite side you just do the same thing. For the middle support I just measure to the center and then use the paper to determine how high to put the bracket. It makes it go so much more smoothly and so much faster, which is always a plus in my book. Here is the rod I put in my living room. I'm planning to add some bamboo roman shades too, but I just can't find the right color/size combination yet. I actually used two separate curtain rods on this window to create one long rod. I didn't want to have to order a special long rod so I grabbed two of these 80"-120" rods at Homegoods for a great price and pieced them together. It worked perfectly and left me with an extra rod for our guest bedroom. I was so excited that it all worked out the way it did. I'm hoping to share a preliminary house tour soon, so stay tuned for that! What a simple but sanity-saving trick! And I love the new pillow combo on your couch! how does your living room ALREADY look amazing?!?!?! and congrats!!!!!!! Well, aren't you smart?? Such a great tip. Love those wonderful windows!! FYI, I found my bamboo shades on Overstock. My windows are so big that I had to get three smaller ones and hung them together to look like one long shade. Works pretty well, and much more cost effective than a huge one. Looks like you'll have your panels to cover the edges anyway, so that's great! How fabulous is this. Great idea and the drapes look wonderful too. Genius! Congrats on the new house. It already looks beautiful. Love the idea, but where did you get your pillows? 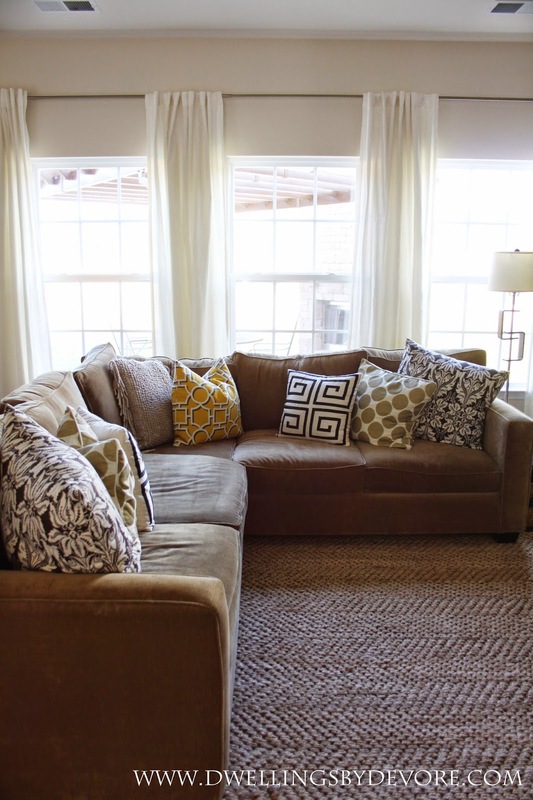 I love the patterns, and they look nice and big (which I need for my large sectional). COngratulations on closing!! And I need you to come over, you have excellent curtain hanging skills! Yowza! We closed on a house last week and are about 3 weeks out from getting our stuff in! Your living room looks perfect already! Wow - that picture with those huge windows! 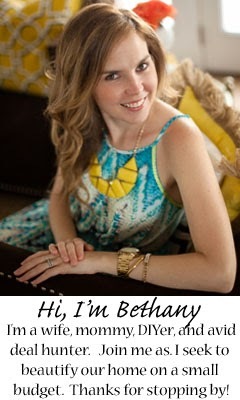 In my head I was like, "Wait - that's not Bethany's living room!!!" Oh goodness - can't wait to see your new crib, and more specifically: your epic decorating skills in a fresh, new space. This hint is one that will go into MC's file ASAP. He has been agonizing with hanging rods for years! So exciting. Let the fun times begin! Congrats and SO good! I love it! I'd have to agree with Cassie Bethany! You're some kind of amazing!